Available in 4 packs of 16oz cans. 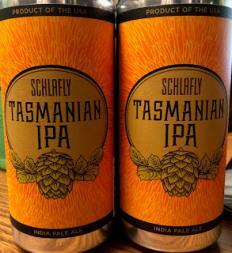 Schlafly Tasmanian IPA is brewed with 100% Australian hops. The Tasmanian hop, Galaxy, is a strong, aromatic variety that is different from traditional strains of the Pacific Northwest. Our brewers developed a recipe that showcases the hop’s unique flavors of citrus and pineapple.